Rum, gun barrels and fun. 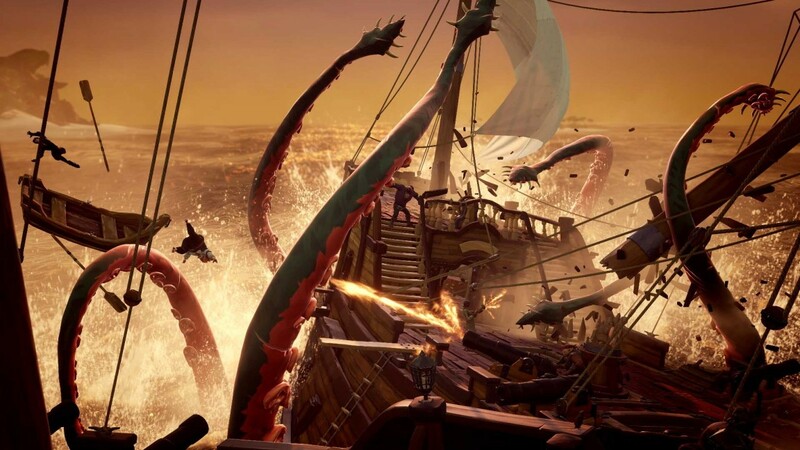 I feel like I have to open a preview for Sea of Thieves with an admission: I’ve a really large soft spot in my heart for Microsoft’s remaining triple-A British developer. I was precisely the right age to fall in love with the company’s output during its late SNES and N64 heyday, though I do think that it’s rightly fallen in people’s stock since those days. Sure enough, Viva Piñata and Banjo Kazooie: Nuts & Bolts are arguably two of the cleverest and fun games of the last generation (even if Banjo wasn’t what fans wanted from that series at all), but the company needs something significant to stake a claim in the market as strong as it did in the good old days. After spending a little time with Sea of Thieves, I think Rare could be on to something special again. And even if it doesn’t end up being a large-scale success, it’ll certainly at least become a deserved cult classic as Viva Piñata did last generation. The E3 Sea of Thieves demo casts several players as a group of pirates with their very own ship. It drops you onto a lovely island with a colourful art style defined by chiselled characters with slightly hard-edges to their designs… and that’s it. It drops you in, but it doesn’t offer much in the way of tutorials: you just go. This is what the dubiously-executed Xbox press conference video for the game was trying to get across. That video saw a number of community members from social media and Rare fansites playing the game early in the studio. 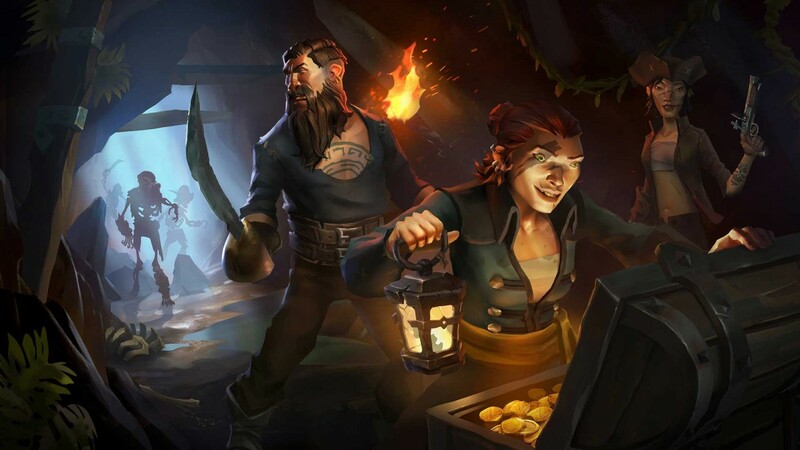 With no instruction they were sent into the world of Sea of Thieves, and what the video depicts is their escalating understanding of what they can do in the game, culminating in epic-looking battles at sea. All this is true in my demo, too. I open by drinking too much and then drunkenly staggering my character around the beach. Eventually I head to the ship to join my companions, and there the game’s co-operative nature comes into play. Even getting a ship out of port is something of a task. You need to set sails and hoist anchor, for one, and both are completed more quickly if players work together. All of this is perhaps best exemplified in actually sailing the ship. I’d never considered this about ships before, but when the sails are down they block the view of the person at the wheel, which is of course at the stern of the ship. If you’re steering, you’re also sort of blind. and so, again, the ideal scenario involves another player up in the crow’s nest to help give you broad directions of how to steer. Something of this reminds me of some of the best times I’ve had in another excellent open-ended game – Minecraft. 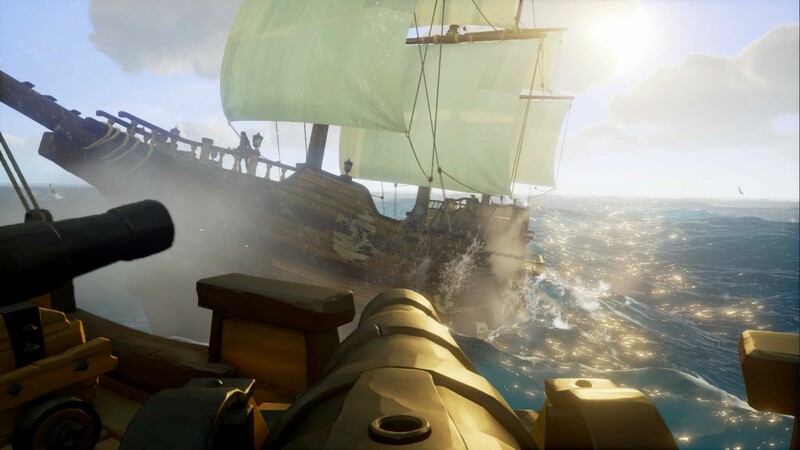 Even with three complete strangers, getting our ship ready to sail in Sea of Thieves felt like some of the best collaborative fun I had with friends on our private Minecraft server building group projects or tackling the game’s boss battles. 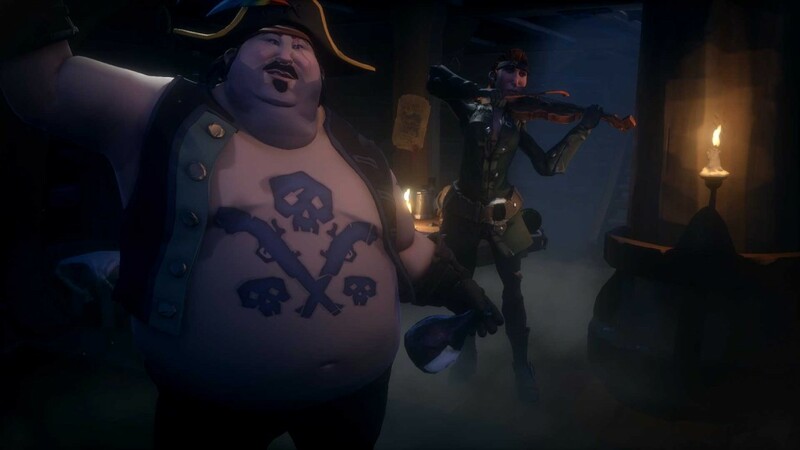 Sea of Thieves evoking that to me is one of the highest compliments of co-op I could give. It doesn’t give you specific objectives or direct you, but the tasks it does give add up to something special. Less can definitely be more. Beyond co-operative action there is of course competitive play, and one of the incentives in this small demo zone to get your ship ready is that there’s other groups of players out there in the world who may well want to attack and sink your ship. The action at sea is exhilarating, with players again having to zip about the ship at speed to man the various things needed. Firing cannons requires a man to actively get on them. Firing them is simple controls-wise, but there’s a degree of skill required to get it right. There’s no hefty, detailed modern HUD to show you where your shots are going to land as in, say, Assassin’s Creed’s sea battles. Instead, the game expects you learn as you go while dealing with the natural sway and shift of the ship on the waves. It feels natural, and it’s challenging in just the right way. If you get hit, there’s other things to do on the ship such as patching up holes to slow how quickly the ship fills with water. There’s something rather gorgeous about the water physics here too, with the way water poured into our (sadly doomed) ship quite impressive-looking in its own way. I don’t want to seem like one of those people whining about having an amazing job (because, really, I’m lucky) but it is true that one can’t quite help but spend a lot of E3 tired and grumpy. Appointment schedules collapse, it’s hot, it’s loud, your feet hurt, you’ve barely slept. In spite of that stuff Sea of Thieves had me grinning ear-to-ear like an idiot for my entire play session, and to me that’s bloody notable. It’s all clearly currently a proof-of-concept. It looks like a polished game, but Rare is also still clearly hashing out exactly what the game’s structure should be. I was told that Rare wants to try to have a ‘proper’ beta of the game in order to fully scrutinize how players make use of its systems to tweak and change it. Eventually this will become a fully-fledged retail title, however, and for a first hands-on showing this felt strong indeed. I’m definitely looking forward to seeing more. To catch up on all the games, trailers and impressions from E3 2016, check out our hub here.